Toxoptera are small to medium-sized dark aphids. The median frontal tubercle on the head is a little lower than the antennal tubercles. The dorsal body cuticle is membranous, apart from a narrow dusky transverse band on tergite VIII. Marginal tubercles are usually present. The siphunculi are short and dark and slightly longer than the cauda. The cauda is finger-shaped, blunt, dark and slightly constricted at about one third of its length. 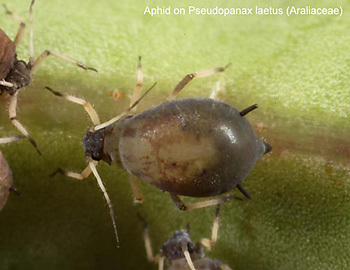 The aphid has a stridulatory apparatus consisting of ridges on the abdomen and peg-like hairs on the hind tibia. There are about 4 Toxoptera species worldwide, on various trees and shrubs. There is no sexual stage in the life cycle, so species everywhere are anholocyclic. They are of east Asian origin, but two species are now widely distributed on citrus and various shrubs. Adult apterae of Aphis (Toxoptera) aurantii are oval, shiny black, brownish-black or reddish brown in colour with rather short black-and-white banded antennae. The antennal terminal process is more than 3.5 times the length of the base of the last antennal segment (cf. 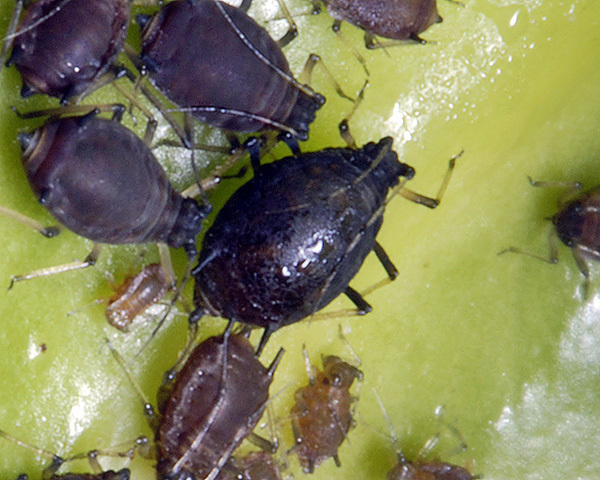 Aphis gossypii which has the terminal process less than 3.5 times longer than the base of the last antennal segment). The cauda and siphunculi are black, and the siphunculi are 1.0-1.5 times the length of the cauda. The cauda usually has less than 20 hairs (cf. 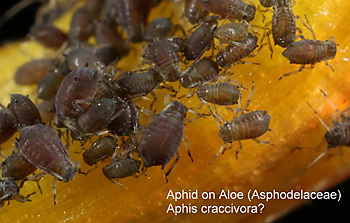 Aphis (Toxoptera) citricidus which usually has more than 20 hairs on the cauda). A stridulatory apparatus is present below and in front of the siphunculi. The body length of Aphis (Toxoptera) aurantii apterae is about 2 mm long. 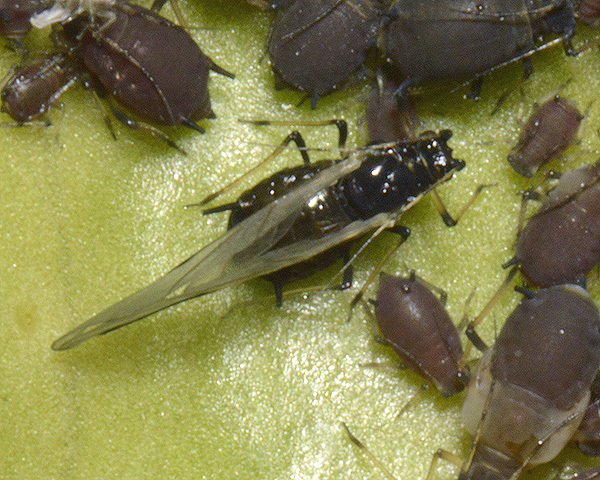 Alates (see second picture above) have the head and pterothorax blackish. The abdomen has dusky paired marginal sclerites on segments 2-5 inclusive, a pair of large postsiphuncular sclerites, and transverse dark bands across tergites VII-VIII and sometimes also on tergite VI. Their siphunculi are 1.25-1.65 times as long as the cauda. The black citrus aphid is found on the underside of leaves of Citrus, as well as tea (Camellia), coffee (Coffea) and mango (Mangifera). 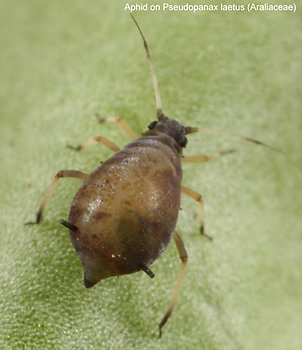 Infestation in spring can be very harmful to citrus crops. In temperate countries Aphis (Toxoptera) aurantii is a pest of ornamental Camellia bushes. 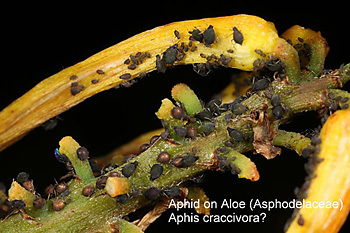 Sexual forms are unknown, and aphids overwinter as viviparae. Adults stridulate by rubbing tibial spines on abdominal striae. Their distribution is now cosmopolitan. 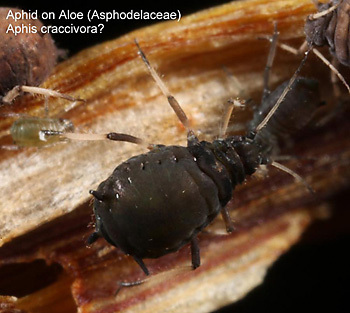 Have always assumed that the aphid found on Aloe striatula is Aphis fabae. Aloe striatula is the hardiest Aloe in the UK, coming from the high Drakensberg in South Africa and Lesotho. However looking at it I think Aphis craccivora might be right. Having had 5 national genera collections of South African summer rainfall species I was more than used to Aphis fabae each sumer. Aloe striatula was annually blighted and more so than related species like Kniphofia. Very interested in your opinion. Images copyright www.aphotofauna.com all rights reserved. Not convinced that this is Aphis craccivora. A. craccivora is usually shiny black because of the dorsal sclerotized plate. It looks more like Toxoptera especially with the reddish nymphs. An aphid on Pseudopanax laetus (Araliaceae), looked at Ivy aphid and it doesn't appear to be, and looked to me closer to Holly aphid. I think they will also be parasitised. They were on a new very young shoot and causing leaf curl in a similar way to Holly aphid. 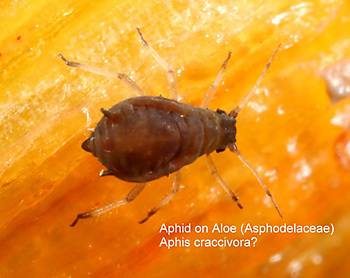 Have check aphids for the host plant and wasn't successful. Lots of Camellia and Toxoptera aurantii in the vicinity but the antennae don't appear to be banded. [Here's a] link to the plant Pseudopanax laetus. Think this is also Toxoptera aurantii I'm afraid - they are very variable!